Introduced in 1993 for the 1994 model year and in time for the 911’s 30th anniversary, the 993 would be the very last of the air-cooled Porsches before the company moved on to the water-cooled 996 for the New Millenium, a step that nobody would have expected a generation earlier and one that frustrated Porsche-philes. It was a hugely important car for Porsche that came at a formative, turbulent time. By the mid-1990s, the front-engined cars were all gone and there was a brief time – the 1996 model year – that the Boxster hadn’t arrived yet and the 993 was the only model in Porsche’s lineup. The 993 replaced the 1989-94 version of the 911 called the 964. The 964, despite its strengths and improvements over the classic 911, was both heavier and more expensive to build than its predecessor. It also received criticism for its rear suspension, which was mounted to the body and juddered noisily under hard acceleration. Porsche even considered dropping the 911 model altogether during the 964’s production run. After putting together a 20-page paper in 1990 that defined what exactly a Porsche was, however, the company bigwigs decided that the 911 was indispensible and actually the backbone of the company. Work on an all-new car commenced. As for styling, it was an all-new look while still unmistakably 911. Styled by Englishman Tony Hatter, it had wide, muscular bulges in all the right places, and the lower front fenders meant that it was the first 911 in which the drivers couldn’t see them from the cockpit. The body had a drag coefficient of 0.33, and while this was technically less aerodynamic than the 964, it also reduced lift at speed. As for power, surprisingly radical ideas were played with, including a water-cooled V-6 or V-8, and even an Audi V-8 with a front-mounted radiator was tried, but these were all deemed too costly so Porsche stuck with the tried and true and set about further improving the 964’s flat-six. Porsche redesigned the bottom end, added hydraulic self adjusting valve clearance and completely redesigned the exhaust. Front brakes were also enlarged, a limited-slip differential was optional, and overall the 993 was 20 percent torsionally stiffer than the 964. Because the all-wheel drive 964 had made up about 20 percent of orders, the system was further improved in the 993, and the Carrera 4 system only added 100 pounds to a two-wheel drive version. The four-speed Tiptronic transmission was carried over and improved as well. The 993 was available in rear-wheel drive Carrera, Carrera S or all-wheel drive Carrera 4 and Carrera 4S trims, as well as Turbo and Turbo S, which had smaller KKK turbochargers to reduce lag. Body styles included coupe, cabriolet and a targa with a sliding glass roof instead of the removable piece found in previous 911 Targas. A 993 Speedster was considered briefly considered, but never introduced. Reception for the 993, which was admirably priced cheaper than its predecessor, was immediate and enthusiastic. Motor Sport succinctly proclaimed “this is by far the best 911 so far” and Car and Driver remarked that “this is the first 911 that’s truly chuckable, and you would have to do something stupid to get into trouble…all the involving intricacies of the chassis’s personality are still there to be savored.” Car and Driver also called the 993 Turbo, which could do 0-60 in an incredible 3.6 seconds but offered impressive comfort and drivability, “the planet’s most eminently practical supercar”. Special versions of the 993 included the Carrera RS, which was a series of lightened cars with a larger, higher compression 3,746 cc engine, a special rear wing, three-piece 18-inch aluminum wheels, a roll cage and racing seats. These were never officially imported into the United States. 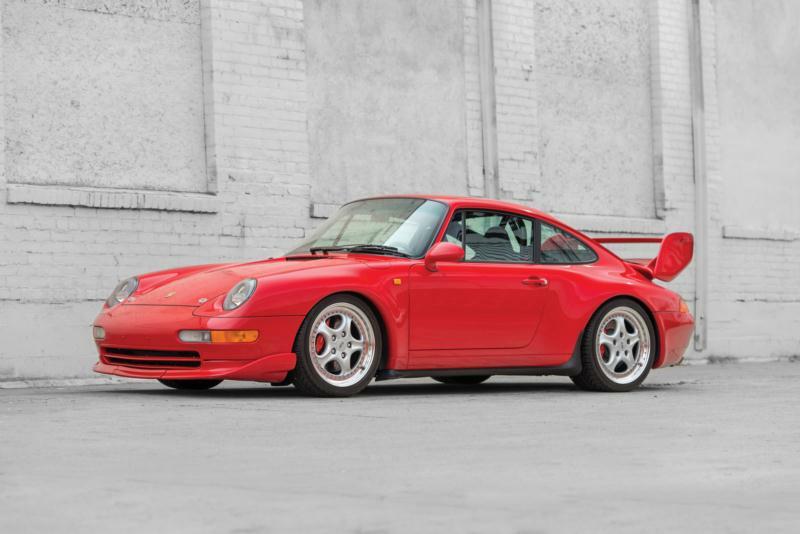 For many, though, the most desirable special version of the 993 was the GT2, a series of less than 60 homologation specials with a 3.6-liter twin-turbocharged engine reworked to give 430-450 hp and a $200,000 price tag when new. The very last air-cooled 911 was a 1998 Mexico Blue Carrera 4S that was sold to Jerry Seinfeld, and it marked the end of an era. Porsche had built 410,348 air-cooled 911s before moving on to the somewhat unloved water-cooled 996. The 993 is collectible for a lot of reasons. It’s not just that it’s the last air-cooled car. It’s the blend of classic 911 looks, heritage and sound with modern technology and conveniences. Many consider it to be the best looking of all 911s as well, and it’s certainly one of the most rewarding cars to drive, even if some of the newer 911s are quicker. While 993s are mostly without the potentially catastrophic faults of some later Porsches, they are not without their problem areas. Namely, leaky rack and pinion steering gear, excess oil consumption, rust-prone heat exchangers and general electrical gremlins are the main issues to look out for, and targa roof mechanisms can fail and are an expensive fix, so a car with a working roof is a must. Otherwise, these are solidly built cars aided further by the fact that they aren’t yet old enough to have suffered severe neglect.